The gravitational pull of the moon makes the surface of the sea rise and fall. As the moon passes overhead, the sea lifts up towards it in a shallow bulge which races round the planet. There is a corresponding bulge at the same time on the opposite side of the planet. In the open ocean the rise and fall is hard to detect even with delicate instruments, but close to land it can be considerable. The sun also affects the tides but less because it is much further away. When it pulls in the same direction as the moon it increases the effect of the moon. This causes the cycle of spring and neap tides. 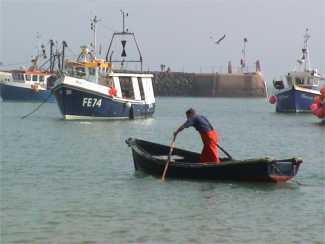 Some parts of the world have a very large tidal rise and fall so that a sailor who leaves his dinghy tied to a harbor bollard may come back six hours later and find it dangling from its rope, 20 feet above the muddy bottom of an empty harbor and separated from the water by hundreds of yards of exposed mud and seaweed. See Tidal Range, below. If the tide is to rise at point X, water from all around has to go to point X. Therefore the rise and fall of the tides creates tidal streams in the sea. See Currents. The rising tide can reverse the flow of a river in its estuary. A few shallow estuaries have a tidal bore wave. Tide tables state the time of high tide, the time of low tide and the vertical tidal range that day. This entry is from tables for a north Atlantic port with a large tidal range (the height figures are in meters) and semi-diurnal tides. To kayak in an area with a significant tidal range, you need to know what the tide and tidal streams will be doing at the time of your trip. If you finish at low tide, will you have a long muddy walk? If you go round the headland will you meet a strong current going the other way? Check whether the times are already adjusted for "daylight saving". If not, remember that clocks are set one hour ahead from March/April until October/November. You would not be the first person to mis-read a set of tide tables. So when you arrive at the beach, it is worth looking at the water to see if the tide is doing what you expect. See Visual Check On The Effects Of Current & Wind. It doesn't do to forget about the tides. In the northern Gulf of Mexico and over much of the Pacific they rise and fall on a diurnal cycle, in other words in every 24-hour period there is one high tide and one low tide. Thank you to Bob J from New Zealand for this clarification: "I've travelled, lived, & worked throughout much of the north and south Pacific (other than Antarctica and only a little in Alaska) and have yet to encounter anywhere that does not experience two high tides and two low tides each day. [I understand] there are diurnal ... tides around much of Indonesia ... and Vietnam." 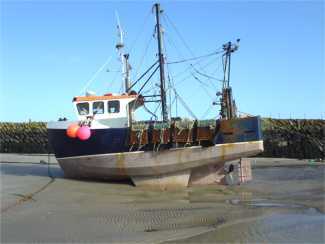 In the Atlantic there is a semi-diurnal cycle with two high tides and two low tides in every period of 24 hours. Actually 24 hours 50 minutes. New York and London have classic semi-diurnal tides. The height of each high tide, and the fall of each low tide, is almost the same as the previous one, and the interval from high tide to high tide is about twelve hours 25 minutes. The Pacific coast of the USA mostly has "mixed tides" which combine diurnal and semi-diurnal characteristics within a cycle lasting a little more than 24 hours. Seattle gets a high tide, then a low tide, then an almost equally high tide, then a very low tide. Los Angeles and Honolulu also have mixed tides. The difference in height between high tide and low tide is called the tidal range. It depends on local geography and on the alignment of sun and moon. See Spring / Neap Tides. The tidal range in most parts of the world is 5 feet or less, not enough to drive powerful tidal streams although you may still encounter fast water at some river mouths and headlands. Big tidal ranges of up to 16 feet can be found in parts of Labrador, Alaska and British Columbia and they are common in north-west Europe. The weather has some impact. 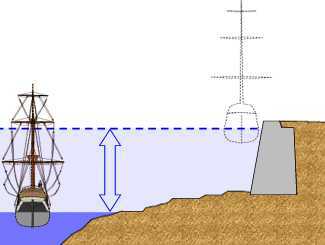 The arrival of a weather system with particularly low atmospheric pressure at the center can add 2 or 3 feet to the height of the tide. The associated winds and low pressure can cause a storm surge and extensive flooding. The Great Lakes and semi-enclosed seas such as the Mediterranean and the Baltic have only a small tidal rise and fall, caused mainly by wind and atmospheric pressure. Over most of the Mediterranean the tidal range is measured in inches but a few ports have a tidal range of up to 5 feet. In a few places around the world there are extremely high tidal ranges because the effect of the moon's and sun's gravity is exaggerated by the shape of a bay. To have an idea of the effect of an oscillation basin, put a couple of inches of water in a large shallow bowl and rock it a little. The average tidal range at Miami Beach is less than three feet. At Charleston SC it is about six feet; 400 miles north at Norfolk VA it is four feet. In New York harbor it is five or six feet. If we go another 400 miles to Nantucket Island we are in the center of an oscillation basin and the average tidal range is only three feet. Another 260 miles to Rockland ME and we are nearing the northern rim of the basin, with an average tidal range of 11 feet. Carry on north into the funnel-shaped Bay of Fundy and we reach the largest tidal range in the world, which can be as much as 56 feet. This diagram shows the maximum tidal ranges round the coast of North America. Yellow indicates a range of more than 10 feet, red a range of more than 20 feet. The second and third largest tidal ranges in the world are in Britain (Bristol Channel, 50 vertical feet) and France (Baie de St Malo, 40 feet). Many tidal streams in these areas flow at 3-5 knots during Spring tides, and reach 8 knots in some channels and where water is constricted by a headland, creating a playground for intermediate and expert kayakers. When planning all but the shortest kayak trip you have to take account of the directions in which the tide will be flowing that day. This is a rough way to predict the height of the tide at any time during the day. 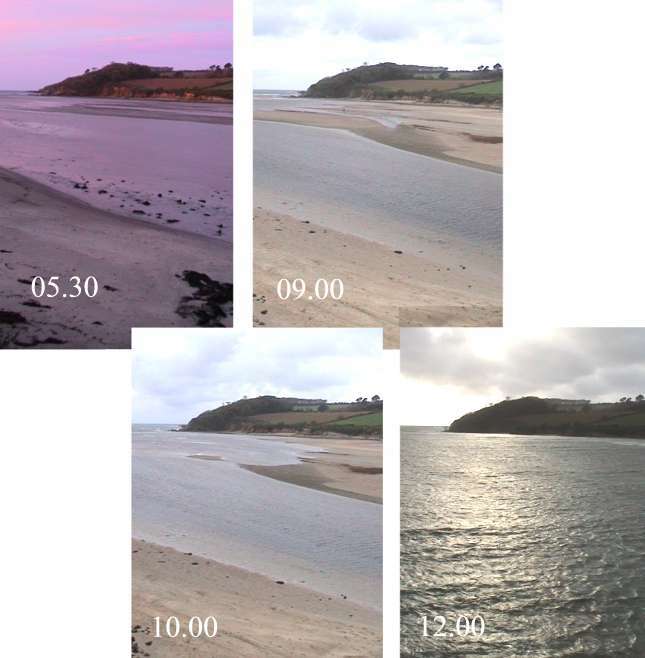 In the first hour after low tide, the water level rises by 1/12 of the tidal range. In the second hour, it rises by 2/12. In the third hour it rises by 3/12. In the fourth hour it is 3/12 again, then 2/12, then 1/12 in the last hour before high tide. There are similar rough guides to the speed of tidal streams. See Tidal Stream Data. The tidal range is the difference between sea level at high tide and sea level at low tide. It increases and decreases on a 28-day cycle so you may find a vertical range of 5 feet during neap tides but 15 feet two weeks later at springs. It is easy to tell whether the sun and moon are in line with the Earth and each other. If they are not aligned, we see a crescent or half moon. When they are aligned but on opposite sides of the Earth, we see the complete white disk of full moon. When they are aligned and on the same side of the Earth, the moon is dark - new moon. In the north Atlantic, spring tides generally occur about 48 hours after full moon and new moon. Some spring tides are larger than others, in particular at the time of the Spring equinox and Autumn equinox ("equinoctial tides"). For kayakers, the rise and fall of the tide is seldom more than an inconvenience but in an area of shallow waters, the difference between high and low tide can be dramatic. A fall of 15 feet may expose a beach a mile wide as in this photo. And you have to carry your kayak across it. Where the coast is low-lying the foreshore is usually either sand or mud. It can be fun to go kayaking in shallow muddy channels, and chances are you'll see a lot of wildlife, but you can get stuck for hours with a band of deep mud between you and the shore. On the chart, look for access points where there is very little foreshore between the channel and dry land, or where the foreshore is firm sand, or there is a concrete walkway giving access to the water at low tide. Anyplace where at low tide you can walk a mile or more over sand to get from dry land to the water is likely to be hazardous to walkers on an incoming tide. The rising tide returns over the sands faster than a horse can gallop. Where a river enters the sea its flow is temporarily dammed by every high tide. In the estuary and for a few miles upstream, river flow slows down as the tide rises. It very often reverses, at least for the second half of the flood tide. If the gradient of the river is shallow the water level may alter with the tides for hundreds of miles upstream. A quick look at the map will usually give you a good idea how much of a river is tidal. A very winding course where the river meanders across a flat flood-plain is almost certainly tidal. For a diagram of flow within an estuary click here. The distance for which a river is affected by the tide depends on its gradient, which you can guess quite accurately from the height of the land. The Algonquin Indian name of New York's Hudson River meant "river that flows two ways" and it flows backwards with the flood tide well over 100 miles upstream. Its waters are slightly salty at Newburgh Bay, 60 miles upstream of the Battery and its level rises and falls with the tides as far upstream as the federal dam at Troy, 160 river miles from the river mouth. Many rivers in low-lying areas are greatly affected by the tide a long way inland. A few are tidal despite running through mountains. The Columbia River has cut such a deep gorge through the Cascade range that its level 130 river miles from the sea is not very far above sea level. On the flood tide, the river flows backwards as far upstream as Longview WA. 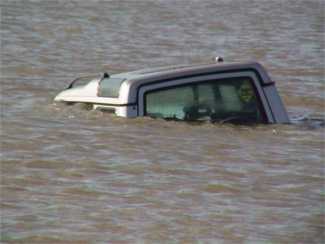 Its level rises and falls with the tides as far upstream as the Bonneville Dam near Corbett OR. Tidal currents in estuaries can be overwhelmed by the effects of heavy rain inland. A river in flood can send huge quantities of muddy water down through its estuary and make the tides almost irrelevant for a day or so. A tidal range of just an inch or so is not enough to have a significant effect on the speed and direction of flow in the river but still very significant to kayakers in countries where the law of private property denies public access to rivers and river foreshores except on tidal waters. A tidal bore is an incoming wave or group of waves, driven by the flood tide, usually in a funnel-shaped estuary, usually only during spring tides. In parts of the world with a tidal range of 12 feet or more you can find a small bore in many shallow estuaries. Generally they'll do no more than make you drop your sandwich and grab your paddle but there are a few major waves. There's a bore in the Turnagain Arm fjord near Anchorage, Alaska, which sometimes reaches 10 feet high and 10 mph. It seems kayak surfers have been riding the wave since about 1990 and they occasionally share the river with beluga whales. Ice is a problem in Spring and the water temperature never goes above 46°F (8°C). There are bores on several of the rivers entering the Bay of Fundy. The Shubenacadie bore is claimed to reach 5 feet high at times but according to Fisheries & Oceans Canada "the largest bore in the Bay of Fundy occurs on the Petitcodiac River. The bore or wall of water travels upriver at about 8 mph and is about 1 meter (3 feet) high during spring tides when the Moon is full or new". In south-west England, the flood tide enters the funnel of the Bristol Channel. When it reaches the top it is further confined as it enters the mouth of the River Severn. There, the flood tide creates a wave which can be over 6 feet high during the Spring and Autumn equinoxes. Kayakers and board surfers can ride the Severn Bore past green fields and grazing cows. The record is about 7 miles. If you want to do a long run, you will need a powerboat in support because the wave gets low and slow in the wider parts of the river. There are sometimes more surfers waiting for the wave than there is wave to stand on. Elsewhere in Britain there are small or very small bores on the Parrett, Trent, Ouse, Welland and Welsh Dee. There are several on the Atlantic coast of France. Try a Google image search on the word "mascaret". Until extensive engineering works were completed in 1963, there was a huge one on the Seine estuary. La barre, as it was called, occasionally damaged moored ships as far upriver as Rouen. At Caudebec-en-Caux it sometimes reached 13 feet high and was capable of causing severe damage to any ship left moored alongside a quay. It attracted crowds from miles around. The long, thin estuary of the Gironde causes a bore 60 miles inland on the Dordogne at St Pardon. Often 3 feet high, it is popular with longboard surfers but we hear it's pretty crowded and there's a rumour you now need authorization to surf. There is a small mascaret in the Baie de Somme and a very small one on the Couesnon river at Mont St Michel. Apparently there's a fair-sized bore on the estuary of the Daly River near Darwin, Australia. Bores 8 and even 15 feet high can be found on the Mearim and other rivers in the Amazon basin, and they're attracting surf tourists from all over the world. The world record holder is the Dragon of the Qiantang river in China. This is sometimes a large but clean and surfable wave, and sometimes a mess of breaking water up to 30 feet high and doing 25 mph.